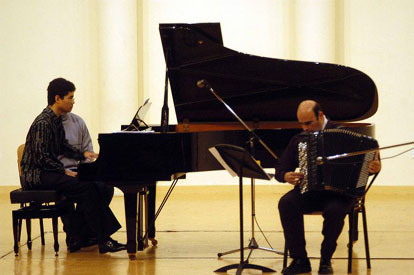 Accordionist Angel Luis Castaño and pianist Ananda Sukarlan has long been soloists with high reputation of their own. Louis Andriessen has written about Ananda Sukarlan : "... An exceptionally gifted pianist, he combines musicality with a very intelligent and sharp insight in both the music and the playing." And Jesus Torres , whose unequalled " Itzal " was written with the collaboration with, and dedicated to Angel Luis Castaño, wrote "The multifaceted possibilities of the instrument was introduced to me for the first time by this extraordinary accordionist. Extraordinary for many things : his extreme sensitivity, bewildering technique and intelligence in choosing the repertory, which made him a complete artist capable in deep understanding of the essence of each piece and most important, mastery in communicating it to the public." Angel Luis Castaño is also the dedicatee of practically all the best pieces for accordion solo by the Spanish composers Cesar Camarero , Gonzalo de Olavide, Carlos Peron, Jesus tueda, Tomas Marco, etc. Wanna contact AN-Tifon ? Just open hailing frequency ; their communication channel is .... an_tifon@yahoo.es .